Valproic acid plasma concentration decreases in a dose-independent manner following administration of meropenem: a retrospective study. J Clin Pharmacol. 2009 Nov;49(11):1363-9. Drug-drug interaction between valproic acid and meropenem: a retrospective analysis of electronic medical records from neurosurgery inpatients. J Clin Pharm Ther. 2017 Apr;42(2):221-227. 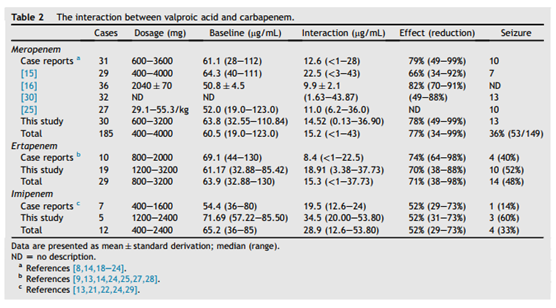 Drug interaction between valproic acid and carbapenems in patients with epileptic seizures. Kaohsiung J Med Sci. 2017 Mar;33(3):130-136.